In 2008, the Hohle Fels Flute was discovered in the Hohle Fels cave in Germany's Swabian Alb. The flute is made from a vulture's wing bone perforated with five finger holes, and dates to approximately 35,000 years ago. Several years before, two flutes made of mute swan bone and one made of woolly mammoth ivory were found in the nearby Geissenklösterle cave. The team that made the Hohle Fels discovery wrote that these finds were at the time the earliest evidence of humans being engaged in musical culture. They suggested music may have helped to maintain bonds between larger groups of humans, and that this may have helped the species to expand both in numbers and in geographical range. In 2012, a fresh high-resolution carbon dating examination revealed an age of 42,000 to 43,000 years for the flutes from the Geissenklösterle cave, suggesting that they rather than the one from the Hohle Fels cave could be the oldest known musical instruments. 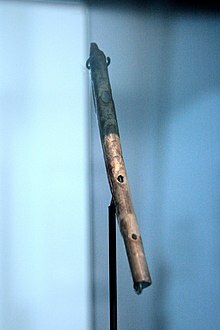 The artifact known as the Divje Babe flute, discovered in Slovenia in 1995, has been claimed as the oldest flute, though this has been disputed. 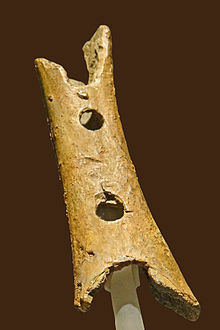 The artifact is a cave bear femur, 43100 ± 700 years old, that has been pierced with spaced holes. Its discoverer suggested the holes were man made and that there may have been four originally before the item was damaged. However, other scientists have argued that the holes were chewed by an animal. ^ Conard, Nicholas J.; Malina, Maria; Münzel, Susanne C. (2009). "New flutes document the earliest musical tradition in southwestern Germany". Nature. 460 (7256): 737. Bibcode:2009Natur.460..737C. doi:10.1038/nature08169. ISSN 0028-0836. ^ a b "Earliest musical instrument discovered". The New York Times. June 24, 2009. Retrieved July 15, 2017. ^ Higham, Thomas; Laura Basell; Roger Jacobic; Rachel Wood; Christopher Bronk Ramsey; Nicholas J. Conard (May 8, 2012). "Τesting models for the beginnings of the Aurignacian and the advent of figurative art and music: The radiocarbon chronology of Geißenklösterle". Journal of Human Evolution. Elsevier. 62 (6): 664–76. doi:10.1016/j.jhevol.2012.03.003. PMID 22575323. Retrieved May 25, 2012. ^ "Earliest music instruments found". BBC News. May 25, 2012. Retrieved May 26, 2012. ^ "Earliest musical instrument discovered". International Business Times. May 25, 2012. Retrieved May 26, 2012. ^ Diedrich, C. G. (1 April 2015). "'Neanderthal bone flutes': simply products of Ice Age spotted hyena scavenging activities on cave bear cubs in European cave bear dens". Royal Society Open Science. 2 (4): 140022. Bibcode:2015RSOS....240022D. doi:10.1098/rsos.140022. PMC 4448875.